How do we express the noise within without blowing out the sound system of our friends and family? Whoa! Where did that come from?’ ‘What’s wrong with you?’ “Why are you ‘freaking out?’ If frustrations are mounting, welcome to Badger country. Communicating anger constructively is Badgers art and her medicine vows loyalty to the sacred process of getting upset. It’s time for things to change. Anger, like the light of day will not be denied. It burns bright and must be honored. Badger medicine is a master at venting and sending all that high charged energy into the Earth. Earth is the ultimate neutralizer to our electromagnetic emotions. It may be time to get barefoot and stand in the grass, or maybe some mud therapy. Gardening and pulling weeds is preventative medicine. But when obstacles have piled too high, this medicine reminds you that there is no such thing as defeat in Badger’s world so keep trying. This little excavator can claw and tunnel her way out of any thickness. The thicker the better! She lives for digging and if she’s appeared in your life it is time to weed out the old and forge new tunnels. Rearrange the furniture. Try a new food. Your tastes may have changed. Bagder medicine is okay with the fight inherent in living life. She’s a boxer and a prize fighter. But she also knows that not all life is a battle. Her wisdom teaches us how to handle anger immediately and minimize the time spent in the grips of that difficult (but unavoidable) perspective. From Badger’s understanding, anger is a spiritual storm that must run its course to truly be gone. Author, Robert Augustus Masters has spent a lifetime investigating anger along with all the other tough emotions and his work teaches that we make a clear distinction between Agression vs Anger. It is time to stop blaming the pure, natural cleansing process of anger on all the hostility that arises. As Martin Luther King Jr, and others can attest to, Anger is not inherently hostile. It is inherently powerful. It is our duty and responsibility to learn how to wield our natural born powers. Robert A. Masters teaches how to remain connected to ones heart when in the grips of anger and to not allow a disconnect to enable you to see a loved one as impersonal. Remembering that if you care about that person, it is your own heart beating inside their own. Treat them as you would treat your own innocent heart by remaining open to receiving their responses and putting the effort into presenting your justified anger in a way that they can process. In this way anger can work for you both like a storm that clears the forest of dead wood. To learn more about Robert Masters‘ work listen to an interview or read his many books. Anger is a call to take action. When it rises that means it is time to make a change. Are you resisting change out of loyalty to a philosophical decision you made long ago? Badger advises us to scrutinize and reconsider all past decisions. That goes for major life philosophies too! We can not predict how we will change in time. Whatever holds up under true scrutiny will lead you to a healthier, ever expanding perspective. Sometimes we lose our cool. The key to dismantling anger is accepting it’s uncomfortable sensations both in yourself and others. Dodging and deflecting are not a part of this creatures medicine. She confronts problems with all her heart. What you resist will persist so turn around and dig up that buried pain. Find the real root cause of the anger. Most likely, it is not caused by the person on the receiving end. In the midst of anger, our misguided perspective is, ironically, seeking peace through the anger. No one wants to be angry. People get upset like clouds gather in the sky. And like the weather, there is logic and a healthy function to our inner storms. And no emotion emerges for no reason. No emotion is unfounded or unexplainable. We may not like or approve of the explanations that arise but Badger medicine doesn’t judge the worthiness of anger. If you’re angry, you’ve got a reason. Find it and see if you agree with it. Badger advises we tend to those reasons when they are young sproutlings, easy to uproot. But sometimes the anger is clearly aimed and clearly ‘deserved’ by the one receiving it. 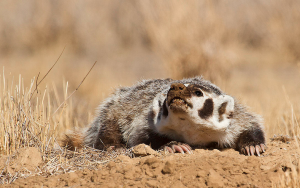 In such a situation, Badger medicine reminds us that once the storm cloud has burst it does not go back and continue to burst again and again over the same issue. New clouds may form for new situations, but in order to reach that new peace, you must find a way to really let the rain cloud break. Grudges are only an indication that you have not sufficiently “freaked out” enough over the issue. If you find you are not able to forgive and forget- it may be time to find deeper healing methods to really uproot and clear long standing stones of anger. Visit Snake on how to really dig deep into spiritual healing. But most of the time surface level anger is easily managed with a little understanding about the physics and properties of that delicate emotion. Anger is contagious. When someone is angry at you, you usually have a reaction to get angry back. How dare they get angry at you! You’re gonna just get angry right back and show them. Next time, see if you can dodge the impulse to return the agression and just receive the other person’s misguided anger. On the other hand, if it is not misguided, it may be time for an apology! Own up! And grow! More often than not, however, anger is caused by the difficulties of living life among all the traffic, and crowds, technology, and social procedures which, to our timeless spirit, seem so limiting. As children, in order to fit into society, we are often taught not to get upset- as if we had a choice in the matter. Anger is an undeniable condition of human nature that speaks a strange language we desperately need to learn. H0w many more centuries have to go by before we finally accept that it is not possible to learn how to not to get upset? It can’t be done. So don’t even try. What if, instead, we learned how to move through the anger with the understanding that it is a temporary but necessary process in the quest for peace and clarity. We may not be able to prevent ourselves from getting angry, but we can learn how to stop reacting to another person’s anger and hold ground for someone rather than make matters worse. Then our children might avoid developing those big boulders of frustration later in life that are so difficult to dislodge. When you are on the receiving end of anger- dig in and hold ground for that loved one who is wrestling with some tough root of their own. They do not mean you harm. They actually only need your help. They need their anger to be received without hostile reactions from others. They need space and acknowledgement. Getting angry at someone just because they got angry at you, (and damn it, you don’t deserve that kind of treatment-) will never allow the initial frustration to untangle itself. Often times what someone is angry about has nothing to do with you even if their words are aimed at you. Words are so very easy to say. Badger suggests you let words be just as easily forgotten! You may be the target of someones anger simply because you are the only one who cares enough to stay in the room. Call on Turtle and Armadillo to keep your boundaries clear. Allowing someone to express their anger enables an intimate exchange of acceptance and trust that will ultimately be returned in kind to you. When we do allow someone to grapple with their anger even if it means taking the brunt of the storm, there is very often a grieving and sorrow afterwards that follows from the angry person. Can you accept their apology and let it go? Learning how to hold ground and weather the storms of others teaches them by example how to weather your own storms. With this agreement the land between you can expand and thrive. On the other hand, Badger medicine also teaches how to get out of the line of fire. Excessive hostility from another should be met with clear, definitive aggressiveness to mark boundaries and keep peace. If fighting has become a way of life it may be time to put up a few fences. Is someone always asking you to forgive and forget that last rampage? Do the rampages happen every week? Every month? They shouldn’t. Most of your time on Earth can be mostly peaceful. Is fighting an addictive pattern? If so, it may be time to let go of those arrangements and seek relationships that teach you how to find peace. We can’t always avoid arguments and anger but we can learn how to minimize how much time and energy they take from us. For a relationship to work, trust and safety must be the dominant experiences most of the time. All emotions are stepping stones towards greater joy and some emotions are situated closer to joy than others. Anger is right in the middle of the emotional scale. It is a pivotal place where our great passion for life meets a deep and dangerous frustration about the limitations of life conditions. Badger under her mountain knows that no matter how big or heavy the ‘reality’ of her situation is, she has the power to change it. When we find ourselves standing on the anger stepping stone we must take extreem care with ourselves and others. We must move cautiously as we navigate the tangled root system that holds the deeper cause of our anger. On this pivotal stepping stone, it is in anger where we have the ability to spiral up into higher hopes or spiral down into deeper despair. Anger is an alarm warning that your immediate attention is required. Stop what you are doing and get to the root of the anger. Do not continue your business goals from an angry place. Do not ignore the strongest warning signs you have. Western cultures have been taught that anger is inappropriate and that it should be avoided or repressed. But sometimes feeling anger is an improvement from the powerless emotions we are stuck in. On the emotional ladder, despair and depression are hopeless states that could lead to serious illness if left uncared for. If anger is rising and you feel it is burning away long standing sadness, follow that anger towards renewed passion. If anger is giving you a new sense of personal power, follow the flow and try to articulate it without judgment or mockery. Let yourself be angry even if part of you thinks it is silly to be so. Acknowledge what is and watch then how it changes. When anger arises this is no time to run away. It is time to dig in. When we tell ourselves we ‘shouldn’t’ get angry we shut down our sense of personal power and self worth. If you are someone who has been trained not to get angry, listen to no one who advises you ‘calm down.’ Get angry at such people and get away from them. Find a stronger dynamic with someone who understands that anger is a part of everyone’s life experience. Enduring friendships are formed when two people are strong enough to endure the others process of anger and not take the struggle personally. Legalize your right to express the painful truth within and trust that you will find a way to express it to those you love without destroying your bond. It is not always possible to avoid hurting others. Such a goal is unrealistic since we have no idea who we are becoming. But it is possible to change together and minimize how much time is spend locked inside painful processes. When we try to avoid the discomfort rising we prolong the suffering between us. If, however, you find you have a short fuse and yelling at people has become a source of quick-fix comfort, Badger asks if you can start to imagine a different way of being. Is it possible to locate the ever lasting peace within your true nature? Badger knows- at the core of the Earth and the core of you, in the eye of the storm, there is deep eternal peace. When anger no longer creates a feeling of progress, it is time to move out of that long standing misery and reach for the next emotion… hope. Have you lost sight of human potential? Have you given up on possibilities? Is the surge of anger a drug you use to avoid growing up? It is time to use all that power and energy to build a bigger home for yourself. If fighting with others is a common part of your daily life, imaging how much more you could accomplish without wasting your precious resources of time and energy. Regardless of the topic, content and justifiable reasons you may have to stay angry, Badger asks you to examine the usefulness of that activity from a success-oriented perspective. Despite your current circumstances, Badger wants to remind you that anything is changeable, including that seemingly permanent sense of rage. No amount of resistance can break a Badgers spirits. Rocks and roots are the obstacles they signed up for. And such barriers are not cause for anger, they are only cause for aggressive action. Aggressiveness is not the same as aggression. Being aggressive can happen with or without feeling aggression or anger. We do not need to be angry in order to be effective. The choice of experience is yours. Badger’s wises advice is to remember that practicing violence makes more violence and practicing peace makes more peace. Sometimes obtaining peace may require aggressive action but keeping angry aggression out of your experience will ensure long lasting succes. That may all sounds quaint and lovely advice for blogging, but when real anger descends upon us, we all know how methods and suggestions for anger management fall to peices. When we are furious the last thing we want to do is sit still and chant or punch the ever annoying pillow. We want to punch something real! That will transfer the pain we feel! Can you stop that transference and put an end to the current of pain? When the grip of anger is strong within us, Badger reminds us that that is when the true game of growing up is upon us. That is the real work we are about! Technique and skill is nothing in theory. Meditation is wonderful when we are peaceful. But how about when we are not? Can we access the wisdoms of yoga and other ancient advice? Techniques for living life must be tried in the field with trusted team mates. Badger suggests that you view your next surge of anger as an opportunity to step into to the game of growing up and take your best shot at improving communication between you and your world. Go easy with yourself as you commit to learning how to manage one of the most difficult and confounding aspects of being alive. And know that others are learning similar lessons.